Please hide this particular article from any young hopenchangers who suffer from the delusion that Social Security will be around when they're ready to retire. Social security is not earned retirement income, an entitlement nor a benefit. 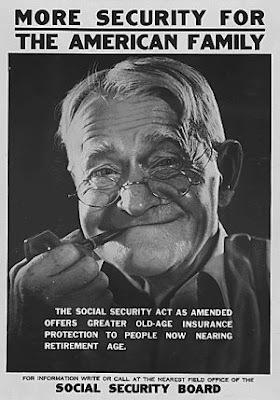 ...However, in the 1960 case of Fleming v. Nestor, the U.S. Supreme Court ruled that workers have no legally binding contractual rights to their Social Security benefits, and that those benefits can be cut or even eliminated at any time. Nestor sued, claiming that because he had paid Social Security taxes, he had a right to Social Security benefits. Unfortunately for the drones (i.e., the Obama Cultists), the math always defeats the political rhetoric. Always. And the fuse on the fiscal time-bomb is fizzling away, without any of our leaders making the slightest effort to douse it.